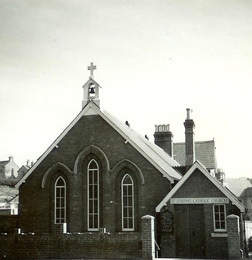 The original St Joseph’s Church was opened in July 1895 and was built on Bournemouth Road. It was designed to seat 150, and serve the Catholics who lived between Bournemouth and Poole. The steady increase in parish numbers led to two new parishes being founded - St Bernadette’s in 1933, and Our Lady of Fatima in 1950 - to serve these areas of the Branksome parish. It was thought these two new churches would ease the over crowding at St Joseph’s, but by late 1960 parishioner numbers had grown to over 1,300 and a bigger church became a necessity. Father Lombardi became Parish Priest in 1956 and faced the urgent need to build the much needed new church. By 1958 he had cleared the parish debt, set up a Building Fund, and was able to go ahead with the plans for building the new St Joseph’s at an estimated cost of £30,000. Father Lombardi was a very capable man, and had the drive and ambition to inspire his congregation to raise the huge amount required. Building began in August 1960, but sadly Father Lombardi was never to see the completion as he died 3 months later. Father (Canon) Gallagher took over as Parish Priest and oversaw the laying of the Foundation Stone on 30 April 1961 and the first Mass being celebrated in the new church on 20 February 1962.